You might have seen a big red bouncing ball with a giant M on it in Melbourne this week, either on your TV screen or in your Facebook feed. Not to be confused with a delicious red M&M, this is the symbol for M Day, Mazda’s biggest sale of the year. So, what exactly is M Day and what does it mean for Mazda buyers? M Day is Mazda’s annual one day, once a year sale. It’s the biggest Mazda sale of the year, with huge offers available on selected vehicles for one day only. 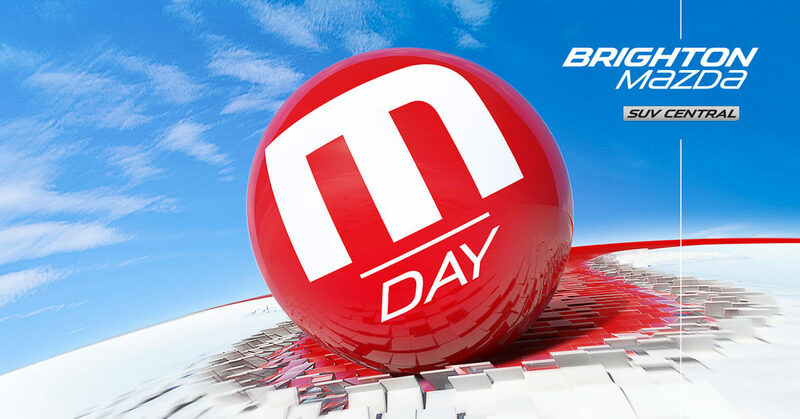 As always M Day will be huge at Brighton Mazda so we are rolling out not just the year’s best deals but there will also be free food, drinks, entertainment and the best dealership coffee in Melbourne! When is M Day on this year? 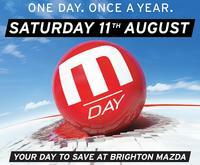 For 2017 M Day will be held on Saturday the 9th of September at Brighton Mazda. M Day is often held on the first Saturday of September each year, but the date does change each year. What vehicles are included in the sale? 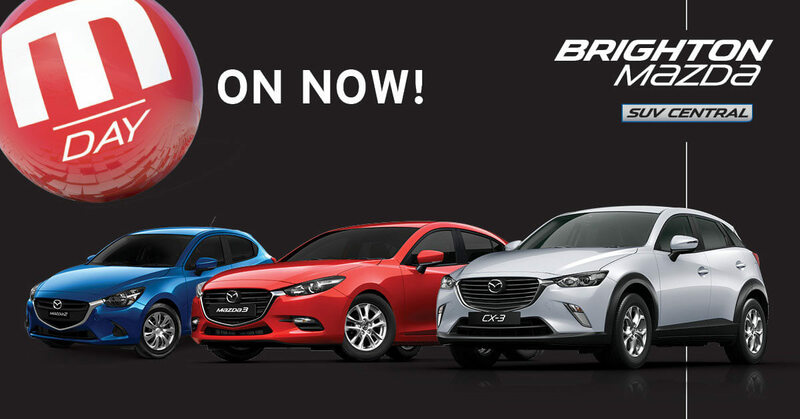 This year M Day offers apply to Mazda2, Mazda3, Mazda6, CX-3, MX-5 and BT-50. This includes new and demonstrator vehicles, but the offer is not available on any used Mazda. 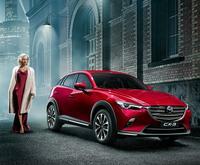 The M Day offers do not apply to Next-Gen CX-5 or new CX-9. What are the M Day Sale offers? Are there any sale terms and conditions? Yes, there are some simple terms and conditions for M Day at Brighton Mazda. The M Day deals are available to private buyers only and apply to new vehicles purchased on M Day, 9th September 2017, that can be delivered within the month of September 2017. 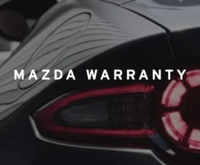 The 3-year’s roadside assist is Mazda Standard Roadside Assist and the Free Registration and Compulsory Third-Party Insurance are for 12 months only. The $500 Genuine Accessories offer applies to a specifically designed M Day Accessories Packs for passenger and SUVs, whilst BT-50’s get a $500 Genuine Accessories voucher. How can I make sure I don’t miss out? Visit our website and read all about our range of new vehicles. Try to narrow down your choice and pick your top two models. You might think about Mazda2 VS Mazda3, Mazda3 VS CX-3 or BT-50 single cab VS dual cab. Book a test drive early in the week. On Saturday, the dealership is going to be bustling, and you may not get a chance to take a test drive on the day. To avoid disappointment, make sure you come into the dealership early to go for a drive, ask questions and talk to one of our sales consultants about model variants and colour availabilities for September delivery. Get your finance arranged before you arrive on M Day. Whether you take advantage of Brighton Mazda’s competitive finance packages, go with your own bank loan or walk in with a bag of cash, this will help ensure a speedy deal. Come in nice and early on M Day ready to make a deal. Grab a coffee, enjoy the atmosphere and free food! Then get ready to drive away in your brand-new Mazda with all the bells and whistles. Visit our website and view our current demo stock. Make sure you give us a call as well as often fresh demos that have yet to be listed online are in our yard and available for purchase. Book a test drive early in the week. On Saturday, the dealership is going to be bustling, and you may not get a chance to take a test drive on the day. To avoid disappointment, make sure you come into the dealership early to go for a drive, ask questions and talk to one of our sales consultants about the demo you’re looking at. Come in nice and early on M Day ready to make a deal. Grab a coffee, enjoy the atmosphere and free food! Then get ready to drive away in your new demo Mazda with all the bells and whistles.